Situated in a stunning private bay is this wonderful kiwi bach complete with postcard-worthy ocean vistas. The 3 bedroom bach is one of only 7 in the bay, it doesn't get more private and peaceful than this! 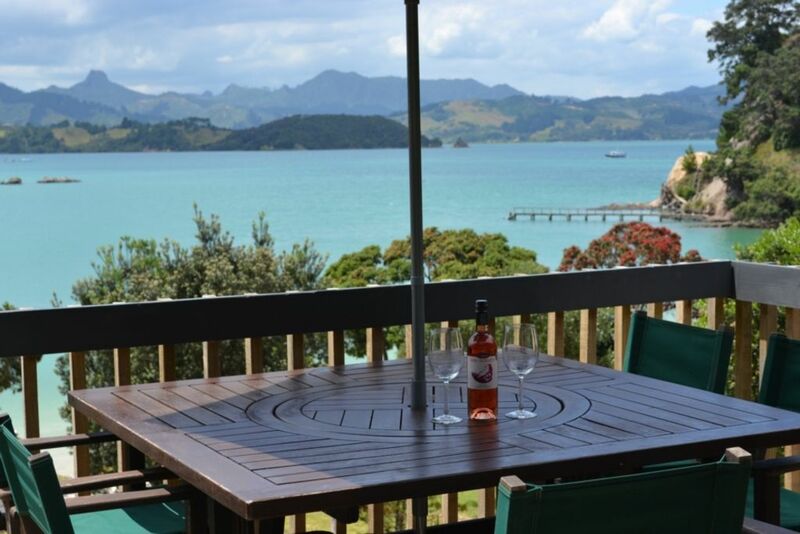 Sit on the deck and soak in the breathtaking ocean views of the Coromandel Harbour. Enjoy the early mornings as you open the curtains in the master bedroom and decide whether it is a day for fishing, swimming or simply relaxing. The kitchen and living area are great spaces for hanging out with family and friends and the bach has everything that you need for your stay. The large wrap around deck is perfect for enjoying a glass of wine and extends the living space. There is a gas BBQ so that you can cook up your catch of the day. The master bedroom has a comfy queen bed as does the second upstairs bedroom. The third bedroom which is located downstairs has a queen bed as well as bunks. Drive your trailer boat straight onto the beach from our private boat ramp and there is a large beach front lawn great for picnics in the sun or cricket etc. There is a jetty and rocks at the end of bay great for kids to fish off and bush clad hills for exploring. Coromandel Town is only five minutes drive away for Restaurants, Cafes and Shopping. We are on tank water, so please conserve where you can. Also there is no washing machine however there is a laundromat in town if needed. Ruffins Bay has been in our family for over 60 years and we have enjoyed many happy memories here with our kids, grandkids and friends. We spend a lot of time here ourselves and love to also share this special place with others. Lovely stay with a breathtaking view! Great stay with all the necessary amenities for a good weekend away. An unforgettable view. Would definitely return. Thanks for great communication Lynne and for letting us create awesome memories at The Bach! Thanks Tanya, would love for you to return one day. My wife and I really enjoyed our stay and so did our dog! The accomodation is unpretentious, clean and comfortable. What a peaceful spot and it was great not to have traffic passing through. We liked the elevation and being able to see over the trees to the other side of the harbour - it's like being in a tree house. Thank you for the opportunity to stay at such a quintessential kiwi bach. We want to come back. Great location, excellent base for fishing, very quiet location. We all thoroughly enjoyed ourselves. Thank you for a lovely stay in your little piece of paradise. We have had such a lovely time. Gorgeous view, incredible stars, and very well equipped home. Everything, including the weather, was perfect. So glad to hear you had an amazing time. Yes the stars are incredible there. It is a well equipped Bach, set in a quiet bay with beautiful views. We thoroughly enjoyed our stay.